My Beauty Diary: Introducing Cubox Korea! Hello girls~ I'm back again with a good news for you. You know, beauty box subscription is very famous lately at Indonesia. I'm sure you already familiar with some of them too because recently I wrote many reviews about it. Now, I will introduce you to a new box in the town~ It is called Cubox! I'm not sure if you already know about this box or not because it's still very new. Now, to make it more clear, I will introduce you properly in this post. Cubox stands for "Curator Box". Cubox korea is the latest e-shopping mainstrem offering a "theme" monthly box subscription containing the Best Curated Korean Fashion, Beauty and Lifestyle Products professionally hand-picked by Top Korean Product Curators. Cubox is based at Korea, but recently they're planning to expand the service to South East Asia countries. Curious right? 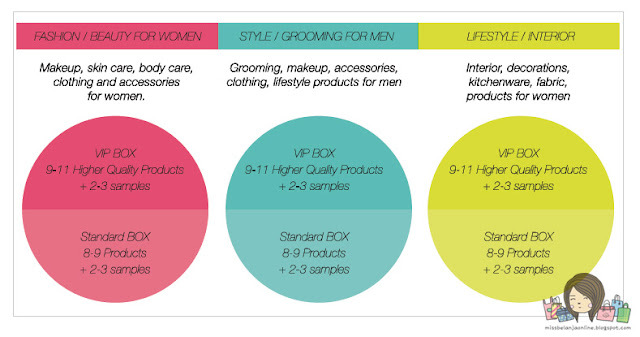 Cubox is quite different with another beauty boxes because it offers 3 different boxes with 2 different price. As you can see below, they have Fashion and Beauty box for women, Style and Grooming box for men, and Lifestyle and Interior box. Yes, they also provide beauty box for men too~ I really love this idea because it is different with another beauty box services. How are the products picked? And who are the curators? They will give a trip to Korea for you and 1 of your friend and they will let you have a shopping experience with their curators! Subcription for Cubox Korea is IDR 540K for standar box and IDR 900K for VIP Box. BUT, *yeah, please understand, there always be a good excuse, right? * there are some reason why you shouldn't complain about the price. As you can see, these are what can you get in 1 box. You can get a beautiful dress. You also can get a full size BB Cream, lip tint, face mask, etc. Second reason: The shipping is free worldwide! you don't need to pay another fee to get your cubox on your doorstep. You only need to pay for the box and the shipping is free. Third Reason: This is seasonal reason~ For next month (May), Cubox Korea is having a big giveaway (like I've mentioned above). By puchasing May box, you will get a chance to go to Korea with your friend. How cool is that? Only spend less than IDR 900k and you can go to Korea! Maybe some of you think the chance will be very low to win the giveaway because there will be many subscribers, right? So here is my opinion: If I subscribe for the box, it is only cost me IDR 900K or IDR 540K if you subscribe for the standar one. But, I can have a chance to go to Korea. What if I win the giveaway? I will be the happiest person in the world because I can go to Korea with only some amount of money. What if I don't win the giveaway? I think it's still okay because I've already got the box that worthed more than the price. to see more information about this interesting offer. Btw mereka gak ada website officiaknya?